Every single season, the expectations for Duke are extremely high. It comes with the territory given the man that stands on the sidelines and how many people would love to play for this team. That's still a lot to ask for out of a team that has four 19 year olds, and Coach K knows it. In fact, he was ready to call out his own fan base for being angry about the team's loss to Gonzaga. Coach K is rarely ever wrong but he hit the nail right on the head this time. The biggest thing to take away was his defense of R.J. Barrett. This is the top recruit in the country and a huge reason why this team is where it is. He was in the sixth college game of his career and somehow he was excused of playing hero ball. Barrett averages over 22 a game and is somehow answering to the most spoiled fanbase in college basketball. It's pathetic. Yes, Duke fell to third in the nation. So what? They still have the likely top three picks in next year's draft, not to mention Tre Jones to fill out the most talented lineup in basketball. It's November. Teams are allowed to lose in November. 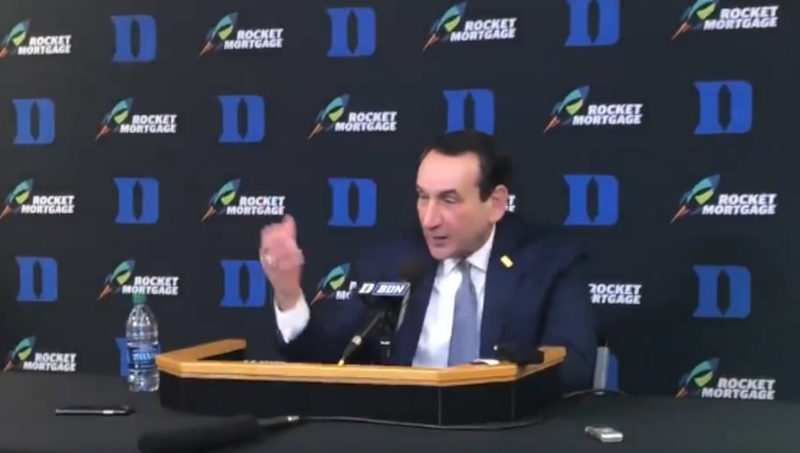 It wasn't quite the Aaron Rodgers "R-E-L-A-X" speech from a few years ago, but hopefully, Coach K got the message across to Duke fans.